Current medical practices prove that the care and treatments delivered within the first hour of a severe injury are likely to mean the difference between temporary and permanent disabilities, as well as between life and death. Trauma system development in the state of Texas began in 1989 with the passage of House Bill 18, which established regional trauma systems. 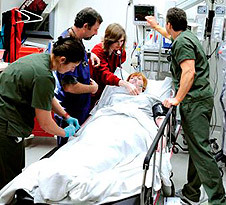 United Regional has been a leader in trauma system development in North Texas and throughout the state. Members of the Trauma Department have been integrally involved in building a regional trauma system at a state level since 1992 and have worked with advisory councils from the Trauma Technical Advisory Council to the Governor’s Emergency and Trauma Advisory Council. At a regional level, Trauma Department personnel have continuously served as members of the executive committee of the North Texas Regional Advisory Council (NTRAC) since its incorporation in 1992. We are located in the center of Trauma Service Area-C which includes, Archer, Baylor, Clay, Hardeman, Jack, Montague, Throckmorton, Wichita, Wilbarger, and Young counties. This region’s diversity, from rural and frontier to urban, represents challenges in terms of emergency and trauma needs along with services available. United Regional serves as the tertiary trauma-receiving center for a primary catchment area, with a population of over 350,000.